Carl Celian Icahn was born on 13 February 1936, in Queens, New York City USA, into a Jewish family, and is a financier, business person as well as an investor, rated by Forbes magazine as in the top 30 richest people in the world, and totally self-made. Carl Icahn was educated at Far Rockaway High School, and then graduated from Princeton University in 1957 with a degree in philosophy. He subsequently began studying medicine at New York University, but dropped-out. Carl began his business career in 1961 as a stockbroker on Wall Street, before founding “Icahn & Co” in 1968, which initially focused on option trading, and in 1978 began investing and taking positions in individual companies. Some of the companies included the American publisher of comic books “Marvel Comics”, “Herbalife” that sells nutrition and skin care products, telecommunications company “Motorola”, “American Can” that used to be a manufacturer of tin cans, and the skin care and fragrance company “Revlon”. 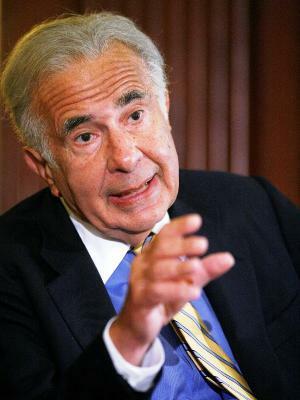 In 1988, after a hostile takeover of “Trans World Airlines” (TWA), Carl Icahn became known as a “corporate raider”, but his takeover techniques brought him $469 million of personal profit from TWA company alone. Carl Icahn continued to invest and buy stocks in many companies, as a result substantially increasing his net worth. In 2007, Icahn became the Chairman of the Board of “Icahn Enterprises” company, the revenue of which in 2012 was estimated to be an impressive $15.39 billion. That same year Icahn owned positions in such companies as “ACF Industries”, “American Railcar Industries”, and “XO Communications”. Icahn’s smart investments and sales brought him the status of a billionaire who has an estimated net worth of $24.5 billion. In 2008, Icahn sold his casinos in Nevada for $1.3 billion, which is roughly a billion more than he paid for purchasing the properties. Icahn’s most recent investments include purchasing 61 million shares in “Talisman Energy”, a global oil production company, as well as acquiring stocks in the IT juggernaut “Apple”. That same year Carl Icahn sold almost 50% of his stock in the “Netflix” company, which amounted to a sum of $800 million in profit. Icahn’s earnings from this transaction are considered to be one of the largest stock gains in history. An investor and businessperson with a remarkable net worth, Carl Icahn is an active participant in charity events. In 2005, he sponsored the building of an “Icahn Stadium” and launched an “Icahn School Program” that pays tuition and other expenses for 10 students every year. Icahn has also made contributions to his alma mater Princeton University, and with the help of his foundation “Children’s Rescue Fund” has built a unit for homeless families, among many other shelters for homeless people. Some of the awards that Icahn received include Starlight Foundation’s Founders Award, Man of the Year Award that he was awarded in 1990, and Effecting Change Award for his numerous contributions to charities. In his personal life, Carl Icahn was married to Liba Trejbal(1979-99) – the divorce settlement is undisclosed – with whom he has two children. In 199 he married Gail Golden. 1 So maybe I'm not going to be Treasury Secretary. The least I can do is warn people about what's happening. And then I can say, "Hey, I told you so." And I'll still make money on it! 2 Many businesses in this country are terribly run. While there are a number of good board members, you've got some board members making $400,000 a year that are actually counterproductive. They're not going to go against their buddy [CEO] who put them there. 3 If we don't get better corporate governance, we're going to lose our hegemony. 1 Endorsed Donald Trump for the 2016 Presidential election.